I am sure that the women who came up with the idea of the GPS must have realized the harmony that this device would bring to the front of a car. We are now on our 3rd GPS for this trip and her name is Bernadette II, she gets it right most of the time, but the programmer who made the map for Portugal must have taken a few too many siestas. So after getting very lost we were extremely happy to see the owner of our final destination waiting for us. 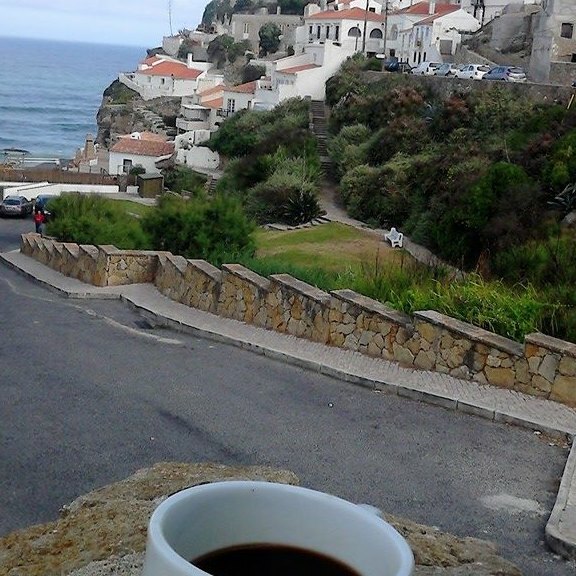 The town of Azenhas do Mar is the kind of place holiday dreams are made of. Our little traditional cottage that is built in to the rock face is perfect. Yes, it is small and yes, the fridge is the same size as the juice container I put in it. 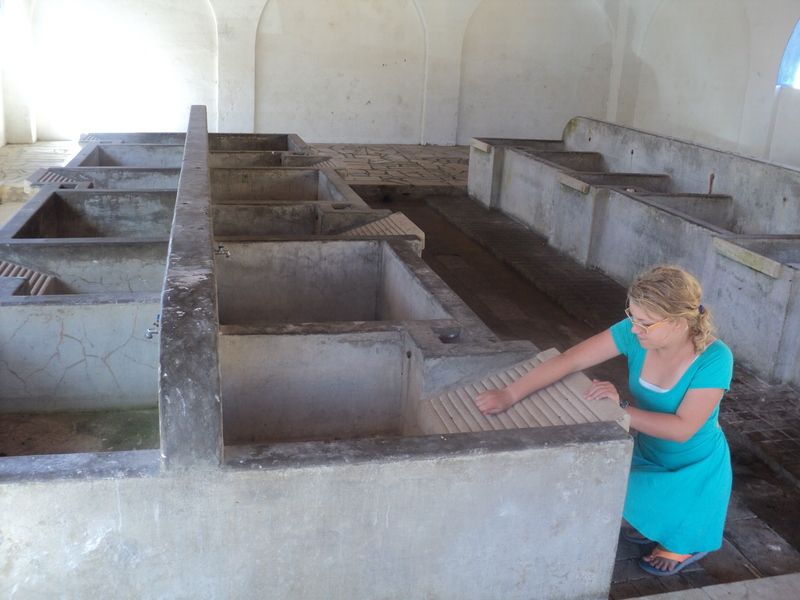 No, it does not have the clothes washer that we desperately need, but I am sure there is one close by. I love this place and it has a stove top coffee maker so nothing else matters. We chose this house for a few reasons, we are 45 minutes from the airport in Lisbon, and very close to the beach as well as the town of Sintra. 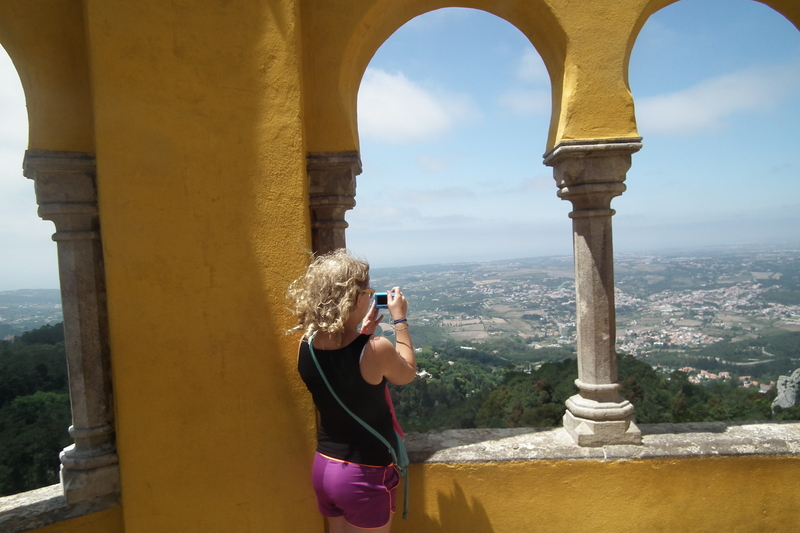 Sintra is the holiday spot that Portuguese royalty frequented. Just driving through the area you get a flavour of the wealth in the area. We head into the town in the evening as we know it will be a hot spot for tourists. The town is jaw droppingly beautiful; it seems everyone lives in some sort of castle. 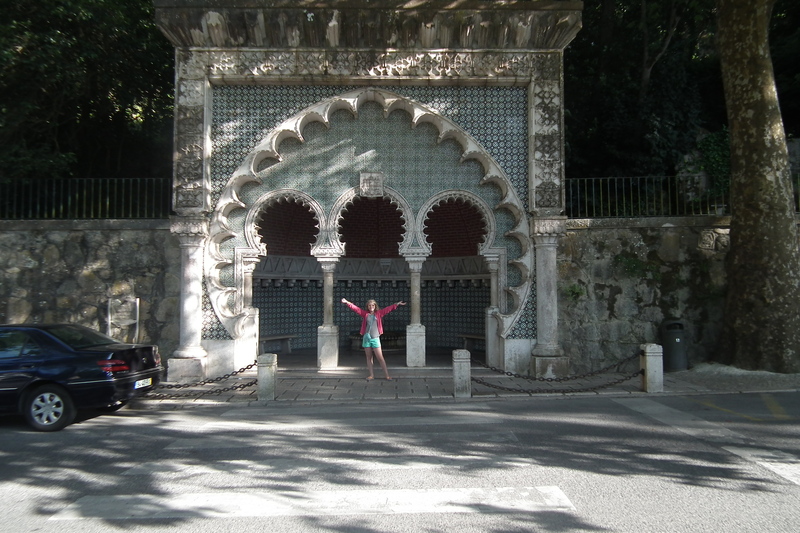 The castle that we are wanting to see is Palacio da Pena, it is up the familiar hill we are used to. But this time the hill is BIG so we drive up it. Sean is now a seasoned driver of Portuguese roads and loves the challenge of honking at every hairpin turn, my foot has made a dent where my imaginary break is! Yikes! It’s high up and it is a clear night, but the castle is in the clouds. Weird. We come back the next day for the shuttle to visit the castle. Poor Mariah is done, she does not want to see another castle, church or ruin. So she stays behind for a much deserved nap. We arrive in town via the trolley car and leave our car behind in the beach town. 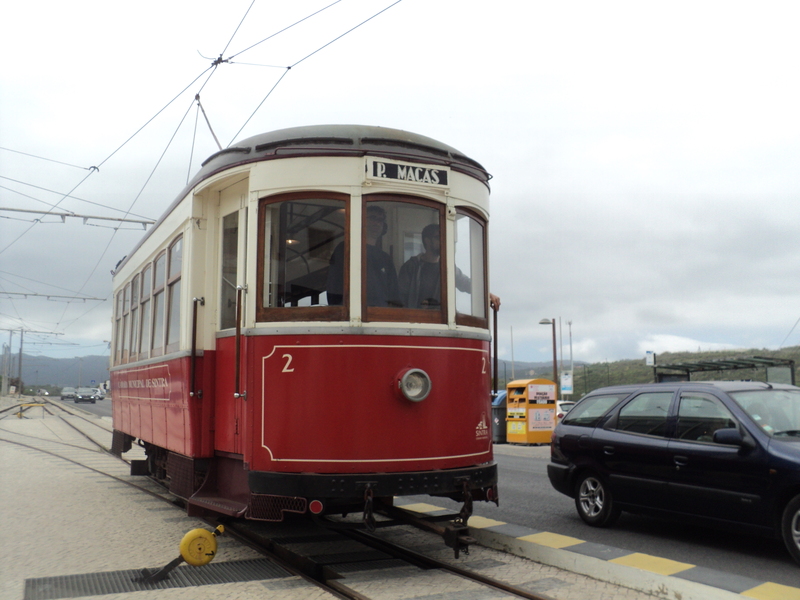 Parking is a nightmare in Sintra and the trolley is a neat way to see the area. The castle is busy, these are the first line ups we have seen in Portugal. There is one more bus ride to get to the castle, but we opt for the walk up the final part of the journey into the clouds. The castle is lovely but it does not seem real, more like a movie set. It is exterior is too perfect, too freshly painted, too Disney-ish. 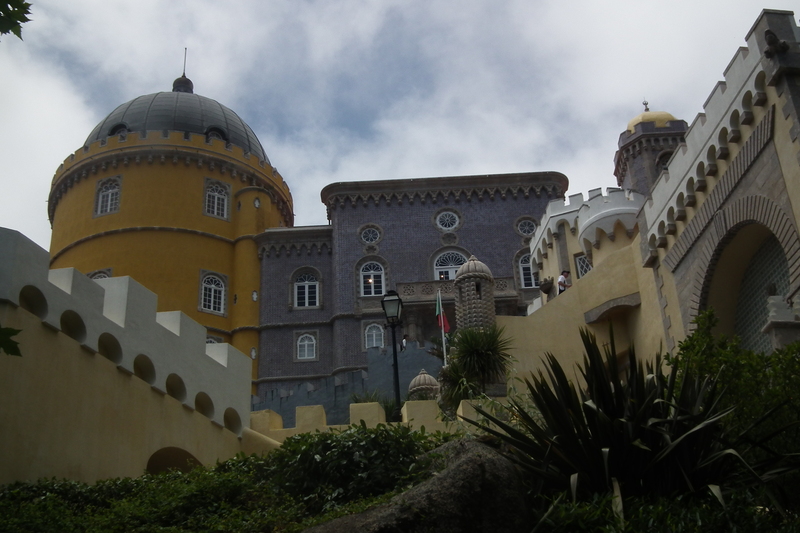 I am pleased to have seen it but the rest of Portugal is not like this castle. It is a bit hard to cook a meal in our beautiful home so we take Goncalo’s advice and visit the restaurant down the road. Yup, this man knows his seafood. We have a lovely meal for very few euros. The girls on the other hand had Tele-pizza delivered to us via a Vespa. I have wanted a pitcher of Sangria ever since we have arrived in Portugal, so Sean and I head down to the beach bar below our house. The sun is setting, the World Surf Championships that were being held down the road are over and the bar has lots of surfing talent enjoying a beer. There is even have a DJ that has a collection of records that he spins. 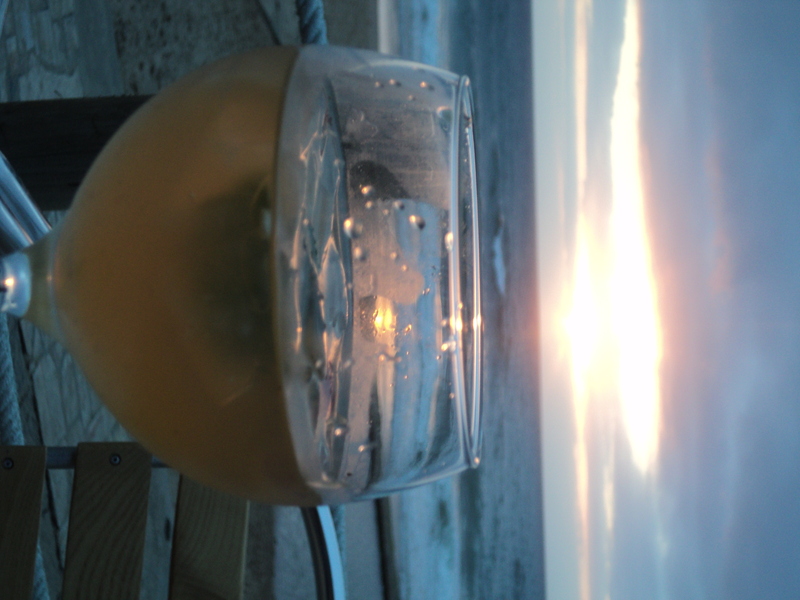 We watch the sunset to some great music and I start planning our next trip to Portugal that will include Azenhas do Mar. This entry was posted in Portugal and tagged Azenhas do Mar, Palacio da Pena, Sintra, Tele-pizza, World Surf Championships. Bookmark the permalink.